I have to be honest from the start here and state that, for some reason, I always associated Timberland with fashion as opposed to Outdoor Gear. Granted, fashion with a leaning towards the outdoors but fashion all the same. A good all round hiking boot ideal for light to medium day hiking at a good price, definitely worth a closer look. Now, I have some Timberland stuff, normal clothing not hiking gear as such, and I really like it. It is good quality stuff. With that in mind I was interested to come across the Timberland Men's Chocorua Trail Gore-Tex Mid Hiking Boots as, after some investigation, I found that they are one of the top sellers in Amazon. The price is on the mid to lower end of the scale, 90 to 140 US dollars, for a waterproof Gore-tex and leather pair of hiking boots. I was interested as from initial observations they looked quite sturdy and functional for that reasonable price. From a style and look perspective, the Chocorua's have a traditional hiking boot look which I like. As mentioned, the upper is constructed using premium full-grain waterproof leather. That combined with a Gore-tex membrane would point towards these boots being pretty good in terms of waterproof capabilities. There are two color combinations to choose from 1. Brown with Green 2. Brown and Green. These two sound the same but there is a difference, it being that the Brown with Green is predominantly brown. I like the simplicity of the autumnal color options and, as mentioned above, overall the boots look pretty good and pleasing to the eye. It has most of the things I consider a must in a good three, possibly four depending where you're hiking, season hiking boot but I wanted to look further into key functional areas to see what I could find in terms of the usual headings like comfort, durability and so on. The Chocorua boots feature an anti-fatigue comfort technology that provides all day comfort, that's the tag line 🙂 after piling my way through over a hundred user reviews, it seems that the boots really do score well in the comfort department. We'll start with the insoles. The Chocoruas feature a removable, dual-density EVA footbed which is perforated for additional air circulation. a removable insole would be standard enough in a good mid pair of hiking boots. What is nice is that in terms of air circulation, the footbed, in combination with the breathable Gore-tex, seems to work pretty well in regulating temperature in the boots which is a definite nice to have. We'll look at breathability more below though. One or two people did comment that they had to add their own Dr Scholls insole after a time. Not too much of an issue and this only came up once or twice. From what I could ascertain, the insoles did their job for a period as expected but then had to be replaced after they were worn out. So, the boots themselves were broadly speaking still good to go, just needed a new insole after a time. Seems pretty reasonable to me. In the photo below, we can see an aerial, if you will, close up view of the boot collar. The collar of the boots are, as you can see in the photo below, thick, as is the tongue so a good layer of cushioning is provided to protect the ankle and upper foot. In all the user reviews I read of these boots, ankle support was not mentioned as an issue and was singled out for the thumbs up by quite a few. Next up we have the Gore-tex membrane which by all accounts works well in helping to keep your feet dry from the inside out. In terms of breathability, there was a lot of very positive feedback and they seemed to do as well in both hot and cold temperatures. Now, I would have initially taken these boots to be a 3 season boot but in many cases I think you could get away all year round with them. It will depend on how severe the winter is of course but I think you can expect year round use on the trail within reason. Next up, we look at the Waterproofness of the Chocoruas. Again, the feedback across the board was generally positive on this front too. they are pretty good on the waterproof front. I think for puddles, snow and very shallow rivers these should do just fine. For anything more, they probably aren't suitable but I wouldn't expect them to be as they're a general purpose light to medium hiker. As with any boots, you need to take care of them to maintain their functionality e.g. waterproofness and so on. From all accounts, if you do, you'll get longevity out of them, anywhere from 1 to 3 years would be a reasonable expectation with heavy use. Moving on, we come to the lacing. Broadly speaking, there didn't seem to be a whole lot of issues in terms of the lacing but it was called out as an issue by some, mainly in the context of the eyelets failing in some cases. If you look at the picture below you can see a close-up of the lacing on the left side of the boot. Broadly speaking the eyelets are secure and I think the level of issues you may experience with lacing may depend on your feet shape and size. Many times laces on hiking boots don't tie well. I usually find this to be an issue with the laces more often than with the boot (Not in all cases though I hasten to add). Other times it can simply be a question of tying your laces a little differently or adding an extra knot. If it is a lace problem, it is usually pretty easily solved by getting a new pair of laces so pretty handy to sort out. I don't mean to flag this as a big problem with these boots, in truth it came up only a handful of times so I expect for most people, there will be no issues. The tongue is gusseted; although I didn't see this listed in the feature list, several people commented on the gusseted tongue holding up well to water. A gusseted tongue is really a must for a hiking boot I feel. With regards to general build and construction, there was one reviewer who made a very interesting observation and subsequent comment pertaining to a manufacturing issue. Having been a long term fan of these boots they noted that the boots made in Vietnam fared better than the pair they got that were made in China. I'm not sure how much you can really read into that but it was an interesting observation from a keen user and obvious Chocorua boot fan. 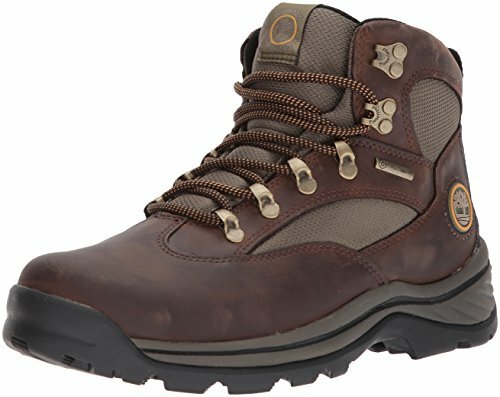 The Timberland Chocorua hiking boots for men weigh in at 2 pounds. so not heavy. This is something commented on many times i.e. how lightweight the boots feel when in use. Always a good thing on the trail to not have to lug heavy boots on your feet as well as all your other gear on your back. Depending on the price range, lightweight can be a trade off for durability but that isn't such a big issue in terms of day hiking. I think you've got a really great day hiking boot here but it may not be as suitable for longer trekking over weeks or months. I didn't see too many references or comments on longer trekking or backpacking trips though so can't say for sure. The next thing to look at is sizing. The Chocorua’s overall seem to fit pretty well. I think from looking at the overall reviews, 85% said it fitted true to size so that's a pretty good hit rate. Some folks did say that they needed to get a half size larger but there weren't too many in this camp. If you're wide footed, you should pay a bit more attention to the sizing information anyway but wide sizes are available so you should be able to get something to suit. For most people though, I think it's safe to say they fit true to size. Not the end of the world if they don't fit as you can return and swap them easy enough. With regards to break-in, I have to say I was really impressed at how many reports there were about minimum to zero break-in time. It was a repeating theme which is great to see. It does seem they fit well and right out of the box which would indicate good manufacturing and design in terms of size and fit. I was impressed that one gentleman had to order a pair of boots, to go hiking in the rain forests in Costa Rica, to literally arrive on the day he started his week long hiking trip. The boots came in in perfect time and he had no blisters or any pain breaking them in. Pretty cool! I hasten to add though, everyone is different and some people may need to take longer to break a pair of boots in than others so a glove like fit from day one isn't a guarantee but it is a very common experience with the Chocorua's. The shaft of the Chocorua's measure approximately 5" from the arch which is pretty much typical for a mid hiking boot. The heel measures 1" and ankle is supported with a padded collar, pictured above, and tongue as pictured below. One thing to mention here is the toe box. A few folks commented on it being a little bit stiff and hard on their feet but I actually think that this is a good thing as that is just part of the breaking in process and it will work itself out. Steel toes are a no-no for hiking boots so having a sturdy leather toe box isn't a bad thing in my opinion. The boot will flex out where required but still give protection. It is actually mentioned as a feature of the design as 'Flexible forefoot construction provides greater comfort'. Basically, there are times on the trail, a bit of toughness on the toe box can come in handy. This was highlighted by one Guy who said he uses these boots for working and they took the hit of a shovel at a very fast pace, bouncing off and protecting his feet in the process! If I transpose that to the trail, I'm thinking of a nasty rock rolling onto my feet, no harm to have the strength in a pair of boots to keep me good. In terms of grip and traction, the Chocoruas feature a durable rubber lug outsole. By all accounts it seems to perform very well on all types of terrain from wet rocks, to mud, soil and snow. The soles are solid rubber and overall seem to be sturdy enough and so should perform well on the trail in most terrains. However, this is one of the few places I did see a repeated comment on the soles wearing down. To be fair, this is after people have been using them for some time, day in day out kind of thing. The boots aren't advertised as resolable though so I guess when they're gone, they're gone. I wouldn't really expect that option though in terms of the price these boots are available for. I have to say that the price seems very reasonable for a pair of mid hiking boots constructed from Leather and Gore-tex. The difference comes in terms of size and so on. Prices are always changing, so to check live prices, please click on the picture at the start of this review or on any of the product links throughout, and you will be taken through to Amazon where you can find an up to date price. From all the reviews I have read and the fact that Timberland is a quality and well regarded brand, I think the price is very good for the Chocoruas. As always, be sure to set your expectations correctly. I think you will get anywhere from 1 to 3 years out of these boots depending what you put them through. If you're wearing for year round weekend day hiking, I think you will be leaning towards the 3 years of use end. If you are wearing them every day for ordinary use, which is absolutely cool, the time may well go down depending on what you're doing in them of course. If you’re an established day hiker these boots could well be a good option to consider. I think they also would be great as an introductory boot for folks starting off hiking. they should be able to cope with most trails and terrains for average hiking use all, or most of the, year round. While the more seasoned hiker will probably be looking for something a bit more versatile in terms of backpacking, hiking and so on, I do think this is a pair of boots for them to consider. 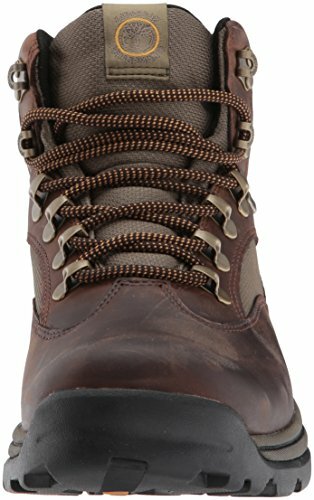 Aside from hiking, I think the Timberland Chocorua hiking boot's for men will be great for casual use too. The best uses for the Timberland Men's Chocorua Trail Gore-Tex Mid Hiking Boots are for day hiking on established trails but I think they're tough enough to take on some off trail action too. I don’t think they’re the best option for very hard off trail hiking or backpacking, there are many other options that suit that better. They’re a lightweight mid hiking boot but they are well constructed and so I think they will work well for light, medium and, just dipping into, hard hiking terrain. They're a multi-purpose pair of boots. For every person I saw talking about hiking, there were equal amounts who used the Chocoruas as work boots. for other general outdoor activities, they should do well getting you from A to B. They also score very highly in the day-to-day use category and won't look out of place with a pair of jeans. With that last comment in mind, if you’re new to hiking the Timberland Men's Chocorua Trail Gore-Tex Mid Hiking Boots could be a good option to consider. If the whole hiking thing doesn't cut it for you, you'll still have a very fashionable, comfortable and cool pair of boots to use as you see fit, perfect for the colder months for sure. As of the date of this post, from about 1100 reviews across multiple retailers, 88% of people gave the Chocoruas 4 stars or more, so they are coming up trumps for the vast majority of folks. I think the question has to be, as en experienced hiker myself, would I purchase these boots? I would probably say I wouldn't as I tend to go for something in the 2 to 400 dollar range as that's where I usually get the quality and construction I need for what I need my hiking boots to cope with. However, would I totally rule them out as a light hiker for easy trails and day-to-day use? Definitely not, so I could see me buying a pair and putting them through their paces. They look great and they tick all boxes for many, many people and I think they're at a very good price level for what you get. For the newbie or casual day hiker on light even trails, the Chocoruas are an ideal choice. For the experienced trekker who pushes things a bit further, although I wouldn't rule them out, you will probably want something more demanding in terms of durability and capability to take on the elements and more varying types of tougher terrain. I always like to look at positives on hiking boots and so I will mention again that 88% or reviewers from a pool of 1100+ gave them 4 stars or more! That is pretty hard to argue with in terms of customer satisfaction and user enjoyment. Taking everything into consideration, the Timberland Men's Chocorua Trail Gore-Tex Mid Hiking Boots are a very good pair of all year round boots that will meet the needs of most hikers so they're worth a look for sure. If you're still unsure what type of hiking boots you should get, check out the hiking boot buying guide and our hiking boot recommendations. I hope you found this review useful. Please comment and / or share it around your networks if you did. Do you use the Timberland Chocorua boots? What was your experience with them? Timberland Chocorua Trail Waterproof Hiking Boot vs Scarpa Mistral GTX Hiking Boot ?? I’m not familiar with the Mistral GTX boots, but Scarpa are a good brand, I’ve used boots from them in the past and had good experiences. However, given the sheer volume of happy customers with the Chocorua boots, I would probably lean towards them. Hope that helps.